THANK YOU to the more than 225 donors who donated almost $28,000 online on April 10, 2019. You have made this year's campaign a huge success! On behalf of the WMPA Board of Directors, WMPA Executive Director, and WMPA Music Directors, we thank all of our generous donors for helping us keep the music playing. The only thing greater than our music is our love for our supporters. We can only be who we are because of you and for that, we thank you so much. DISCLOSURE STATEMENT REGARDING GIVEGAB.COM: All donations on https://www.spring2action.org/ are made to GiveGab, a 501(c)(3) tax-exempt organization which permits donors to advise a regranting of their donations to IRS 501(c)(3) organizations. 100% of your online charitable gift is receipted and advised for regrant to your chosen charity. GiveGab will retain 2.2% + 30 cents of each donation made during Spring2ACTion to cover platform and credit card fees. 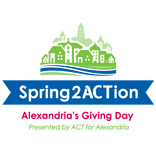 An additional 2.1% of each donation made on Spring2ACTion will be retained at the time of disbursement for Act for Alexandria's campaign costs.